It’s Valentine’s Day weekend! Does that make you happy, or sad? I’m a happily married lady so I should be into Valentine’s Day, but it’s never been my thing. Somehow it feels like a test and I resent being tested arbitrarily. Cody and I are very chill most years, and this one is no exception, but I’ve learned that I need to plan a little or I will feel like an absolute deadbeat wife. So we’re making a slightly fancy breakfast and dinner at home this year (because we don’t like overly crowded restaurants) and probably heading to a matinee, so popcorn for lunch. If I were not pregnant, and if Cody liked oysters, these delectable little gems would be a feature at our homemade dinner. Are you an oyster eater? I get that they can be intimidating little meat-rocks, especially for the home cook, but I shucked my first oyster moments before taking these photos, and it wasn’t a massacre. My advice is to get an oyster knife (about 5 bucks), buy your oysters from the store with the best looking and smelling seafood section in your area, and watch a good oyster shucking youtube video before you start. Maybe have a little cocktail sauce on standby so you can eat the evidence if your first couple end up ugly. 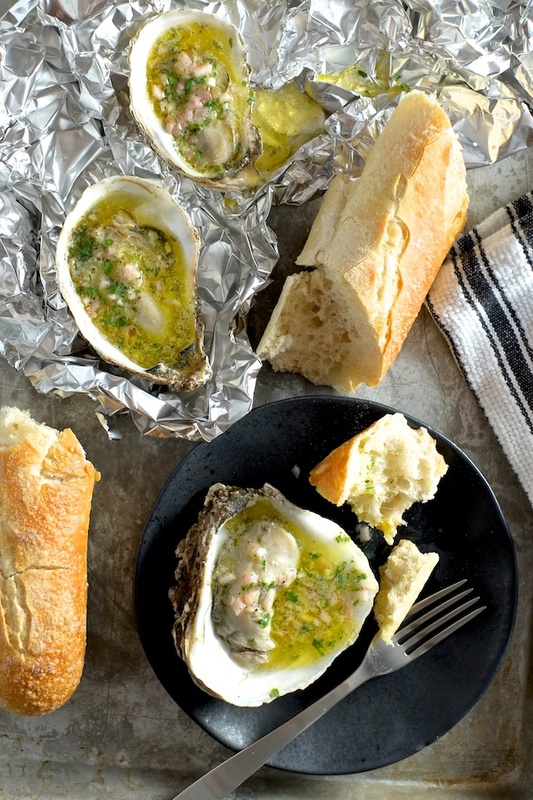 These oysters are quickly broiled, so they are a bit more approachable than a straight raw oyster, and they are basically bathing in butter, so even if your Valentine’s target is apprehensive, you may be able to convert them to the way of oysters. Other advice: use some crumpled foil on your baking pan to hold the oysters upright and keep the liquor from sloshing out the sides (that stuff is tasty). Use a high-quality unsalted butter if you can, but any unsalted butter will do. Oysters are really salty on their own, so salted butter would be a huge mistake. So, mignonette sauce is this old school vinegar and shallot sauce that you will be familiar with if you have ever ordered oysters before at a fancy restaurant. I’ve used the same red wine vinegar and shallot and black pepper combo to make this butter, and added a little parsley for aesthetics (and I guess flavor, sure). 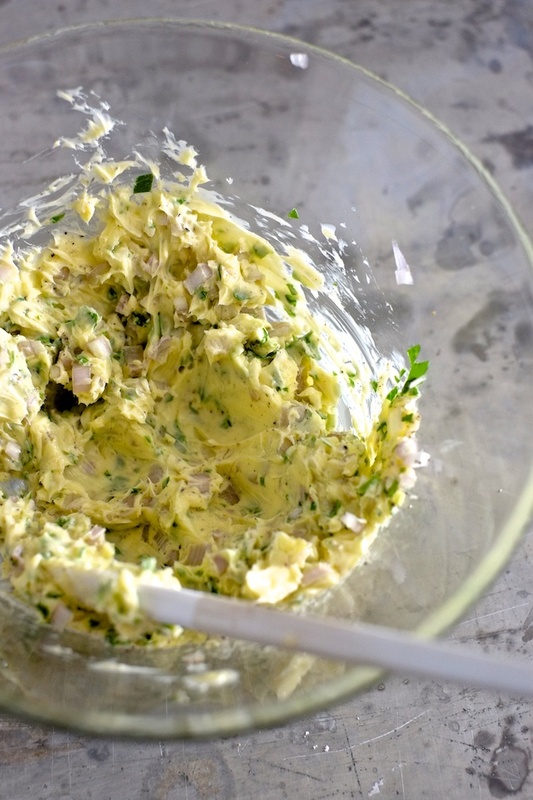 Obviously this butter version is better than regular mignonette, because of the butter. I think these oysters look really impressive, deceptively impressive even. Make some butter, shuck some oysters, pop them under the broiler, and you are suddenly some kind of culinary wizard. Boost your ego, treat yourself, and maybe even impress a date with some butter bathed broiled oysters. 1. 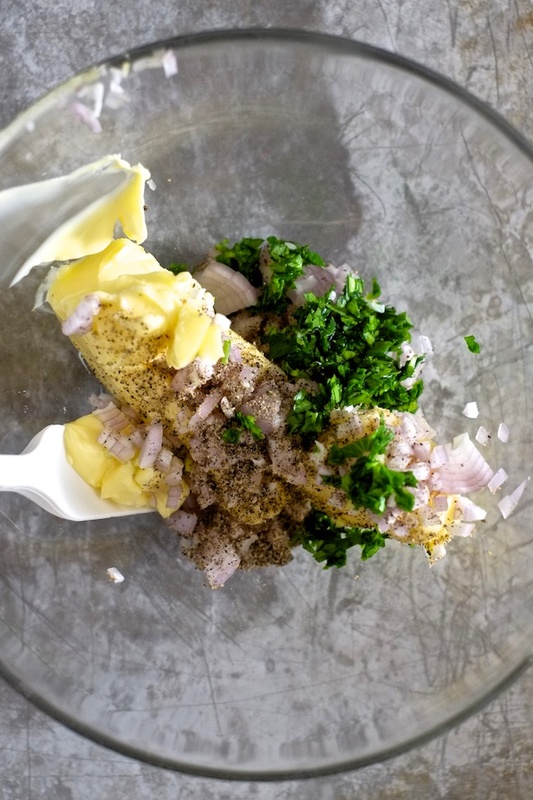 Soften butter to room temperature and use a whisk to combine butter with shallot, vinegar, pepper, and parsley. Set butter aside. You might be tempted to add salt. DON’T. 2. 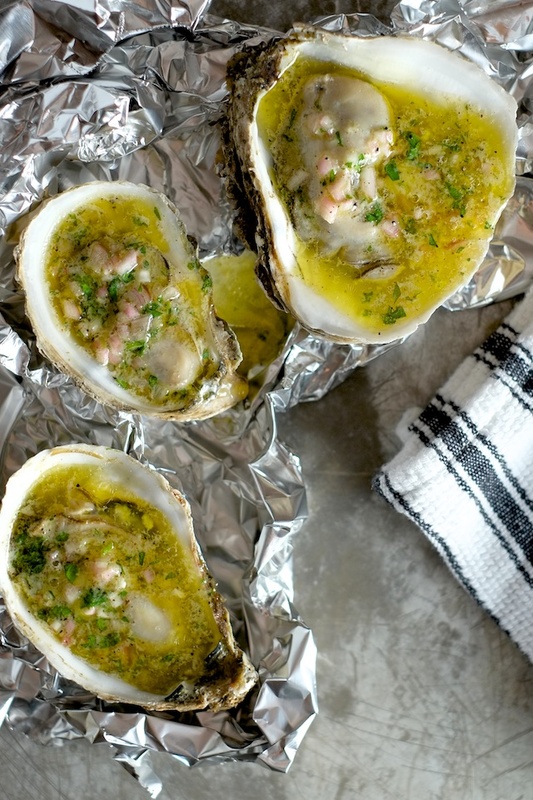 Prepare a baking sheet with crumpled aluminum foil (or if you have it, a thick layer of coarse sea salt, which looks very pretty) to hold the oysters in place and upright while they broil. 3. 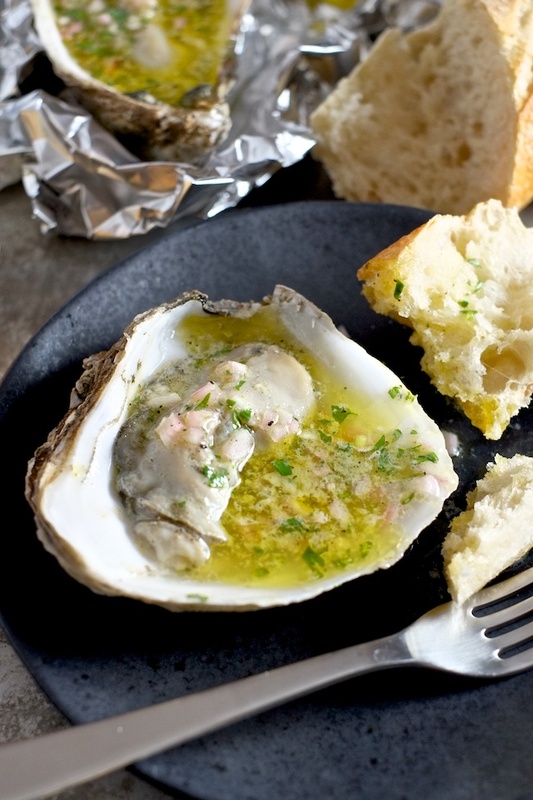 Preheat the broiler of your oven on high while you shuck the oysters. 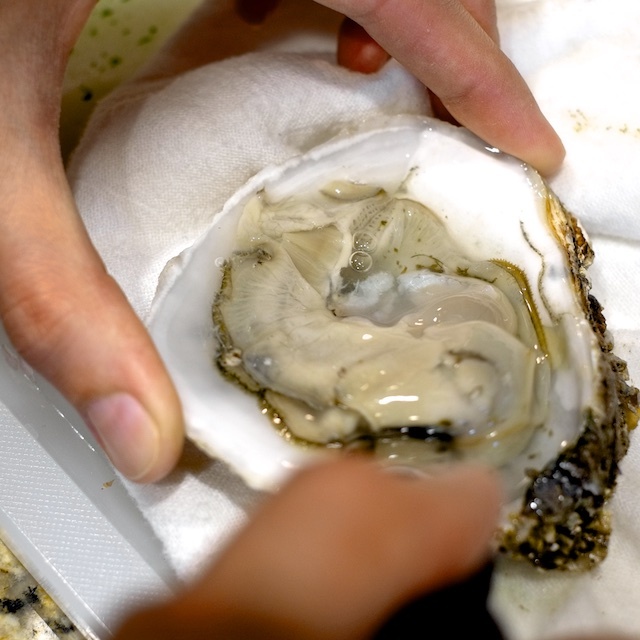 I recommend watching a youtube video like this before you begin, and definitely procure an oyster knife before you attempt to shuck. Keep as much of the oyster liquor as you can inside the shell. 4. 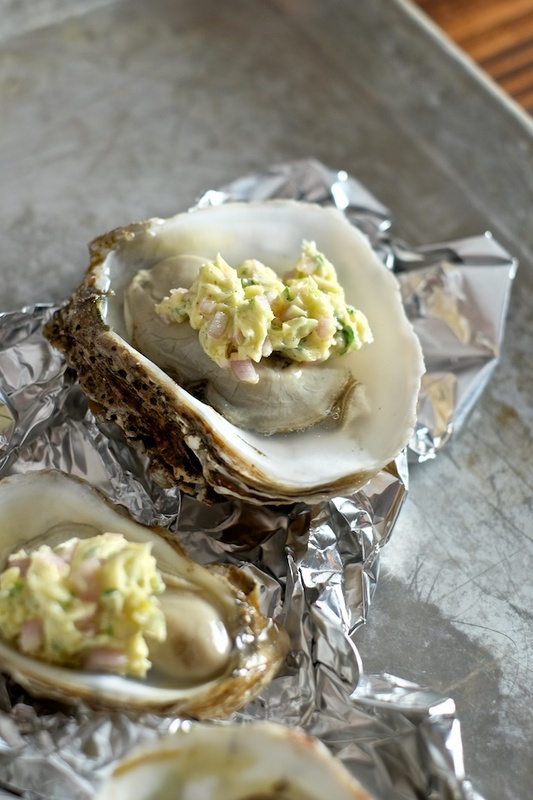 Arrange the oysters so each is level and nestled securely in the foil (or salt). Top each oyster with 1/12 of the mignonette butter. 5. Broil the oysters for 2 1/2 to 3 minutes, or until the butter is melted and the oysters are heated through and just barely cooked. 6. Serve with crusty bread to soak up all the butter.